Healing In Jesus’ Superlative Name. Peter goes on to preach to them as well as to teach them about Jesus name. 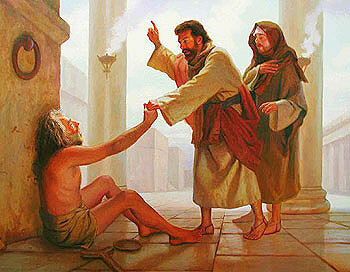 Peter attributed the healing to no unique human powers, but to faith in the name of Jesus. Peter invokes the name with joy and strength as well as full assurance of his delegated authority. The appeals to Jesus’ name as the unmistakable Messiah (Christ), who walked as a man among men (of Nazareth), is an establishing of His Person, His character, and His kingly office as authoritative grounds for extending healing grace. This privileged power is given to us who believe in Him; and we are to use it in confronting the retreating rule that sickness and Satan seeks to sustain over humanity. Previous Only the Holy Spirit can produce Wisdom. Next The Good Confession. I wonder if those that call themselves Christians truly believe the Scripture or if the know what it really means? I would certainly hope so. it is sad when very few will go out and witness to the lost and pray for healings and deliverance whenever possible. So many fear speaking face to face with anyone they do not know. it is a blessing in disguise waiting for a chance to be received. Few understand our authority in Jesus Name. Even fewer use it. Thank you for stopping by please come back and comment anytime. Our God hasn’t changed. He still heals today. I believe that God uses prayer and doctors. There is a reason that God allowed one of his inspired authors to be a doctor (Luke). I have seen how God’s hand has been used this way. My daughter wouldn’t be alive today if it weren’t for prayer and modern medicine. People across the country prayed for her when she had her kidney transplant. I have been a witness to the amazing daily miracle of her life the past few years. She has had her ups and downs, like the week long visit to the ICU just a few weeks ago. Not many knew how serious her situation was, but the few who knew were praying. God used doctors to perform a technique that is and will probably make my daughter’s life a better one. I am greatful to God for his healing power. I, for one, get to see it every day.